Quo Movie FX - Lights, Camera, Action! 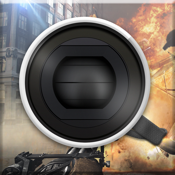 QUO MOVIE FX lets you add Hollywood FX to iPhone AND iPad movies that YOU shoot! - Superhero – Ever wished you had superpowers? Use Quo Movie FX to convince your friends that you do! - Horror – Scare the heebie-jeebies off your friends with a hair-raising horror fx! - Tattoo – Want to see how a tattoo looks on you but don’t want to go through the trouble of pins and needles? Just simulate it using a Tattoo FX. - Surprise – Draw hearts made of lights around your child’s video or choose from a wide assortment of similar surprise effects! Music, Sound FX and Lens Flares! Post to Facebook or Email to friends! Please email support@quofx.com with support questions!